Clocking in at a little over 7 minutes long, Guy Soulsby’s tremendous short film, Devil Makes Work, manages to thrill, entertain, and terrify in a condensed amount of time. Narrated by the devil himself (Shaun Dooley at his grimy best), the story is more of a philosophical rumination on the status of the world and humanity at large. As the devil contemplates the nature of good and evil, winners and losers, heroes and villains (“Some will rise, but most will fall,” Lucifer tells us), audiences are treated to a sinister barrage of characters, including a bloody Jesus carrying his cross, a prostitute and her abusive pimp, a demon-creature in a cage, a growling black dog, and a terrifying satanic witch. These characters are accompanied by frightening images of fire, destruction, and death. When coupled with a soundtrack of pure and ominous dread, these elements come together to create a chilling but poetic mosaic of a world in chaos. Devil Makes Work is a captivating short film, impossible to look away from and worthy of multiple viewings. Devil Makes Work appears to be the start of a much bigger project–perhaps one with more of a narrative or driving plot behind it–but clearly Guy Soulsby is a talented, philosophical filmmaker with a keen ability to depict his ideas in a visually arresting way. Throughout this short film, the colors are rich and vibrant–they seem to almost crackle on the screen as each scene unfolds with menacing terror and bursts of life both beautiful and tragic. Despite the dark imagery and monologue, this is an energetic, exciting work of cinema. There is real beauty here, even as the rioter sets a car aflame, even as the maggots writhe and the blood pours. Adding to the wonder of the film, Seb Juviler’s score is orchestral, tension-filled, and deep; while Nicholas Bennett’s cinematography glides through each set-piece with enough diligent care to capture every striking detail and movement. The visual effects, helmed by James Paul Smith and Terry Tsang, are confident and crisp, never for a moment straying from the brooding atmosphere and complimenting perfectly the devil’s stark and frightening words. The conclusion of the film, while abrupt, leaves the audience wanting more, which may very well be the intent of Soulsby and his team. 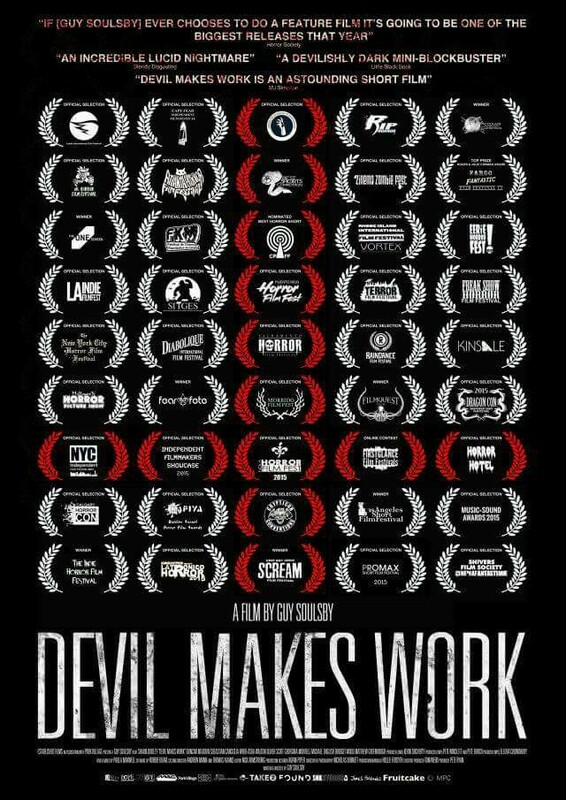 Devil Makes Work has already garnered a number of film festival awards and can be viewed at a handful of links, including this one. The official website for the film is here, where you can also watch the movie and learn more about the objectives of the production team and the inspirations behind the project. Anyone who experiences Devil Makes Work can only hope that Soulsby and his crew will reemerge soon with a new film that will continue to showcase their remarkable talents.